The perfect gifts for music lovers are the ones that help them enjoy music even more, or show off their love of music. These gifts are designed to do just that and are some of the best music gifts you can give. Now that we have your attention, we know it’s unlikely that you’ll drop $32k to give someone the gift of music, but we just had to show you this. It’s been optimized for perfect acoustics so you are hearing the music exactly how it was intended to be heard. These wine glasses are good for those that like wine and music, and sometimes both at the same time. They can hit every note on the scale depending on how much wine is in the glass. Get them enough glasses and they can put on a virtual symphony. This turntable goes where they go so they can always have their music with them. It not only plays vinyl records, it plays MP3s, so it does a good job of covering decades of musical technology in one device. The Bose Wave system is one that you have to listen to in order to fully appreciate what it can do. The crisp, clear sound it produces is perfect for those that really get into their music and want to hear it the best way possible. This chart shows a glimpse of the different guitars out there that are available for you to play. It’s a fun chart for anyone that loves to play guitar, especially if their guitar is one of the ones listed on the chart. It’s also good looking on the wall, and adds to the decor. For those that have always wanted to play piano, but never got up the gumption to take lessons, these DVDs will do the job of an instructor. They’ll be playing simple songs in no time, and be able to move on to bigger songs as they progress. If they can’t be without their tunes while they run, this running vest is one of the more inventive ways to bring their music with them. Sure, headphones are the most popular choice, but when you want to be surrounded by your music, this vest works great. This is a rather interesting group of metal rockers that are actually made out of metal. A great gift for the heavy metal rocker in your life that loves someone strange gifts. They’ll look great in a recording studio or a room dedicated to music memorabilia. This speaker takes up no extra room because it is built right into an ottoman, so you can use it in two ways at the same time. Kick back, relax, put your feet up, and let the tunes from this speaker gently carry you off to a different place. The mobile blastmaster lets you take a serious amount of sound wherever you want to go. It’s made out of rugged materials so it’s meant to take a beating and keep on working. Perfect for trips to the beach, camping trips, and any outdoor activity or event. This doormat is personalized so that you can put the name of the family on it. It resembles an old school mixtape and is perfect for those that still listen to a ton of music from back in the day. The personalization makes it extra special and something they’ll actually use. This mix tape hides a secret inside. It’s actually a rather 21st century flash drive that can hold a lot more music on it than those old school cassette tapes. This is a nice gift for someone that hasn’t forgotten the good old days of mix tapes and songs that hand real meaning to them. These coasters resemble vintage records, and make a great conversation piece for someone that knows the classic music that each record represents. They also do a good job of saving your coffee table from condensation stains. These guitar picks are made out of quarters, so they’ll definitely be sturdy and last as long as you want them to. You can pick which state you want the quarter from, and that will change the design that is on the back of the quarter. These noise cancelling headphones are amazing. They’ll drown out all of the background noise and bring the music the way it should be heard. Works great on a plane, and also in a room that is quiet, since it makes it even more quiet. Less sophisticated than the Bose headphones above, these beanie headphones keep you warm and put your music right where it should be. They’re pretty much a winter go-to when it comes to bundling up and keeping your spirits up with your favorite tunes. This record gets its look from a vinyl record, giving it a classic and retro look, as well as showing everyone that you’re a music lover. This is the perfect clock for someone that still prefers to listen to their music on vinyl. This looks to be a pretty low tech radio, since it’s made out of cardboard, but that’s just the outer part of the radio. The insides are still a new and fully functional radio. It’s good for those that still like to listen to the radio over things like Pandora. This block lets them make all sorts of movable sculptures out of music notes. They’re magnetized and can be put in any position you can dream up. This goes great on a desk and is also fun to play with and put the notes in all sorts of configurations. For those that don’t want to go 10 minutes without their music, get them this wireless shower speaker, and they’ll be able to sing their way through the shower. It’s also a good way to listen to your favorite morning radio show in the shower. This book takes vinyl records and repurposes them into a book. It’s the perfect diary or notebook for a music lover, and is nice and sturdy because it’s protected by the hard outer surface of the record. The inside of the book can be used for whatever they need it for. This card is cute, and is made from washi tape, so it’s not hard to make it turn out just like theirs does. It uses the phrase Everyday I’m shuffling, which is from the song Everyday I’m hustling, but now refers to shuffling through a playlist. This iPhone speaker looks like a very old school gramophone, and the contrast between the modern iPhone and the retro gramophone is a nice juxtaposition that will not be lost on those that see it. This a speaker that also sounds good and doesn’t just look good. Mixtapes are no more, now that there are CDs. The term mixCD hasn’t really caught on, and this is a way to make a CD look more like a mixtape. It’s a clever way of giving someone you care about music that you care about. 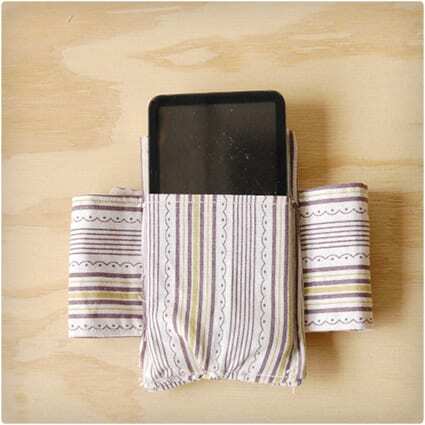 Here’s a handy way for them to bring their MP3 player on their next run. It is comfortable so they’ll be able to go for a longer run. You’ll need to borrow their MP3 player so that you can custom fit it so it stays put on the run. These iPod speakers are made using a vintage suitcase. They are the ultimate in stylish speakers, and are super portable. Take them to the park, or to the beach, or on a camping trip and jam the tunes on a proper speaker. They can rock a clutch that has piano keys on it, and they don’t even have to know that you made it yourself, unless you want them to know you care even more. This is super easy to make, and a great gift for the piano player in your life. Finally a travel gift list for the serious traveler. This exhaustive list of practical gifts covers every element of travel, there will definitely be something on this list that your friend or family member will have overlooked. Avocados are hot (or cold, like in guacamole) right now, so we have found a feast of avocado gifts for you or your fruit loving friends.